When I was forced to move out of my loft in late 2010, I stumbled upon my Roger Taylor books as I was packing. I wrote a post about the author back then, asking if anyone knew what he was up to these days. Roger Taylor is a British fantasy author whose novels used to be published by Headline during the late 80s and early 90s. The books sported very nice covers, and I was a big fan of his for many a year. Oddly enough, I have never read the 4-book sequence that started it all. I discovered Taylor by reading Dream Finder and the author's subsequent novels. All of them are stand-alone sequels featuring certain characters who are wandering in the same universe and following storylines set in motion by the events taking place in the Chronicles of Hawklan. When I realized that all the books I'd been reading were linked to that first series, I managed to get my hands on it. This was the pre-Amazon era, so finding older or out of print titles could involve a lot of legwork back then. And though I ended up reading every other novel but the final installment linking together all the rest, I never did read the original series. Every time I've talked about Roger Taylor since then, I've been meaning to give these books a shot to see if they have aged well. 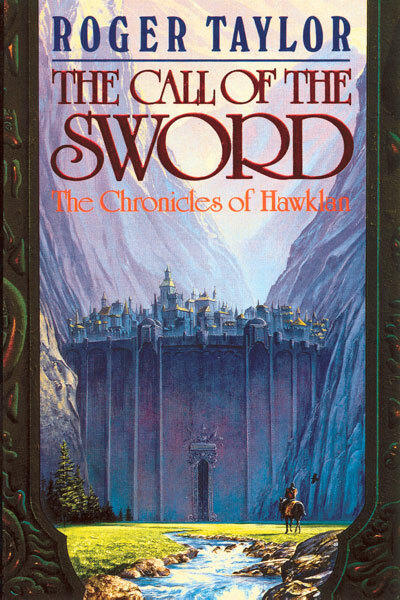 Written between 1984 and 1990, the Chronicles of Hawklan predates the rise of huge epic fantasy titles that were made popular by such authors as Robert Jordan, Terry Goodkind, and George R. R. Martin. It is more akin to series written by David Eddings, Terry Brooks, Raymond E. Feist, Margaret Weis and Tracy Hickman, Melanie Rawn, and other fantasy authors who often found themselves on the NYT bestseller list around that period. Feeling a bit nostalgic, I decided that the time had come to finally read The Call of the Sword. Weighing in at only 268 pages, The Call of the Sword likely would not exist in this day and age. Since its only purpose is to act as an introduction meant to establish the protagonists and the storylines, in today's market its plot would probably have been included in the second volume and the series would have been turned into a trilogy. The main problem with fantasy series of that era is that they're often derivative Tolkien clones. But Taylor claimed to have taken some pains to avoid prophesies, curses, magic artefacts, trolls, elves, dragons, wizards, etc. In his opinion Tolkien dealt with these both excellently and definitively and he cast a long shadow over later writers. Hence, even though the blurb can certainly feel derivative, the plot isn't. At least not that of this first installment. The backdrop is the traditional pseudo-European medieval setting. But there are hints of another, more technologically advanced, civilization which disappeared in a distant past. They left behind marvels such as the castle of Anderras Darion. The trope of the forgotten ancient enemy stirring back to life is exploited to the fullest and is one of the underpinnings of the overall story arc. Especially as far as the Great Harmony of Orthlund is concerned. I would have liked to learn more about the secrets of Anderras Darion and the fortress of Narsindalvak, the Dark Lord Sumeral and his downfall, Ethriss and the Guardians, and much, much more. But as The Call of the Sword is only a brief introduction, these questions will have to wait for the sequels before we can get any answers. Having an amnesic person as the main character makes Hawklan an interesting protagonist. And though there are enough hints to help readers discover his true identity, I'm hoping that Roger Taylor will play with our preconceptions to surprise us when we least expect it. His mysterious raven companion Gavor also seems to be hiding a number of secrets. Often the comic relief, the bird's interaction with Hawklan will make you chuckle time and again. But his referring to Hawklan as "dear boy" all the time gets old real fast. Another plotline involves Rgoric, king of Fyorlund and supposed protector of the peace. More and more unstable, he is reminiscent of GRRM's Mad King Aerys II. Having suspended the ancient ruling council of the Geadrol and formed his own High Guard, the king's decision will prompt fours Lords, Eldric, Arinndier, Darek, and Hreldar, to travel to the royal city of Vakloss and demand answers from their monarch. This was by far the most engaging storyline and it appears to set the stage for the rest of the series. Lord Dan-Tor seems to be the typical evil protagonist, so hopefully Taylor has more in store for him, as well as a few shades of gray to help flesh him out. Although the pace is not particularly fast-moving, one reaches the end of this slender work quite fast. As an introduction, it does its job remarkably well. It establishes the characters and the plotlines, and it sets the stage for what is to come in the following three volumes. And even though Roger Taylor keeps his cards close to his chest in this first installment, there are numerous hints that imply that there is a lot more depth to this series and its sequels. Whether or not said depth will be unveiled in this series, or if it is a product of the eight sequels, is unclear at the moment. Time will tell. . .
With many a reader fed up with the darker and grittier fantasy novels published these days, and many of them wishing for the more "classical" approach of good-versus-evil, I believe that The Call of the Sword could work for anyone looking for something that recaptures the 80s in terms of style and tone. Though too short for my liking, Taylor's debut was nevertheless compelling enough to make me want to read the rest of the series. And you can download the ebook version of The Call of the Sword for only 0.99$ here.